Not for the faint of wallet, this is one mighty snare. Unbelievably, Joey Kramer has been drumming with Aerosmith for 40 years, for which he surely deserves this stunning black beauty. It's a limited production and each drum is hand-signed by Joey on an internal paper slip. 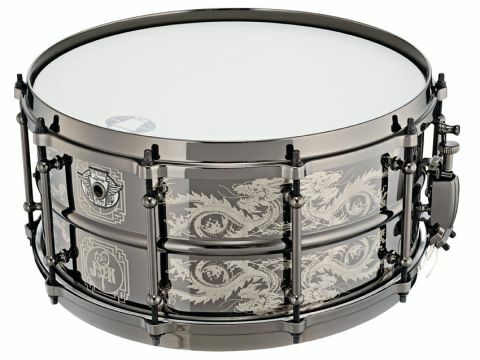 The 14"x6 " black nickel over 1.5mm gauge brass shell is gloriously engraved with dragons and complemented by the 10 black nickel-plated brass tube lugs and 5mm die-cast hoops. The Joey Kramer has nylon washers under the tension rods. It features the same conventional throw-off - a familiar generic model - as the Corey Miller signature model and Ludwig's other new snare, The Brick. It's solid and works a treat. But could Ludwig not have at least put its name on there somewhere, particularly on the relatively expensive signature drums? It rather cheapens what are otherwise typically impressive Ludwig snares. Joey Kramer's brass shell drum is physically much heavier and has a deeper, darker fundamental than Miller's steel drum. The die-cast hoops are potential stick-splitters, but enfold the sound more, so that although loud (the keystone badge says 'hit hard') the effect is less unruly than with the steel drum. It has a fatter and warmer tone with more snare and less clank. It's expensive, but it looks fantastic and is refined, capable of a wide tuning and dynamic range. Tuned high or low it sounds good: tuned way high the enunciation was so clean it was a joy, while at medium tension there is a majestic, warm, thick snarey fatness - a stadium beater.